Diamond In The Rough is a terrific family or group cabin. Diamond In The Rough is a 4-bedroom cabin that will accommodate up to 14 people. This cabin includes 4 and a half baths and has 3 levels. The lower basement level contains a pool table area with a 32" flat screen TV, air hockey room, and a theater room with a 65 INCH FLAT SCREEN with Blu-ray. Other amenities include a screened hot tub area, large gas grill, gas fireplace, water filter system, washer/dryer, concrete driveway and indoor whirlpool. It has a fully equipped kitchen with full-size refrigerator, range, microwave, dishwasher and dining area that seats up to 12 individuals. The living area has a large sectional with a game playing corner. There is also a 46" flat screen with Blu-ray. Bedding includes 2 king, 2 queens, 2 twin bunk beds, and 2 twin beds. The bedding layout: 2 master bedrooms on the main level. The private master bedroom on the left has a king bed, full bath with tub and an indoor whirlpool tub as well as a 40" flat screen TV; the private bedroom on the right has a king bed and a 40" flat screen TV with full bath. The upstairs open-loft area has 2 twin beds, the private bedroom on the left upstairs has 2 queen beds with full bath and 40" flat screen TV, the private bedroom on the right upstairs has 2 sets of bunk beds with full bath and 40" flat screen TV with Xbox One. There is a TV & DVD in all 4 bedrooms and a 46" flat screen with Blu-ray in the living room. Diamond in the Rough got its name when it was being built and the original owner's wife lost her diamond ring at the site. The large stacked stone fireplace includes a large diamond-shaped rock in the inside fireplace area above the mantel. The cabin is just 5 miles from the Parkway, your connection between Sevierville, Pigeon Forge & Gatlinburg, where you'll find all the activity & attractions, including Dollywood, Dolly's Splash Country, Wonder Works, Titanic, Dolly Parton's Stampede, Hatfield & McCoy Dinner Feud, Ober Gatlinburg & loads of outlet mall shopping and restaurants. Relaxing yet fun filled atmosphere. I loved this cabin!! We will definitely be back. I was very pleased with the rental staff, it was very easy to make reservations and check-in, and they were very friendly. The cabin itself had everything we needed, extra cooking supplies, lots of entertainment options, and plenty of room. I have already recommended this rental company to some of my friends. We had a blast staying in this cabin! There were 9 of us and we all had plenty of room! There was one minor detail with the grill, make sure to bring a grill lighter, because it is a hard gas line. The grill does need to be replaced, it took forever for our burgers to cook! But, all in all, was very clean and nice. We will definitely stay at Diamond in the rough again! we all loved it, and plan to stay there again. My wife and I had our three young adult children drive in from from two hours away to meet us at cabin with one friend each. We fixed meals in the cabin, kids were very excited to see there were things to do at the cabin and able to spread out. we had very heavy rains this weekend with floods galore so doing things in national park wasn’t possible. we visited Gatliburg for half a day but kids were content going back to hang out at cabin playing pool, watching movies, getting in hot tub, playing air hockey and spending time together as a family. we plan to do this again at this cabin. we have a big group of guys that get together every year, it is a lot of fun to be able to all hang out together, we have stayed in this cabin now five of the last six years, great time had by all. Diamond in the Rough was beautiful and far exceeded our expectations. The staff was amazing at Heartland Cabins as well. Will definitely return! The kids loved the cabin, as we all did. The amenities were great. Everything was clean. Driveway was a little rough to get into. I was skeptical of renting this unit at first due to previous review about bad smell. Well, when we arrived there was a really bad odor in the lower level However, after doing some investigating, I found the problem and it was an easy fix. 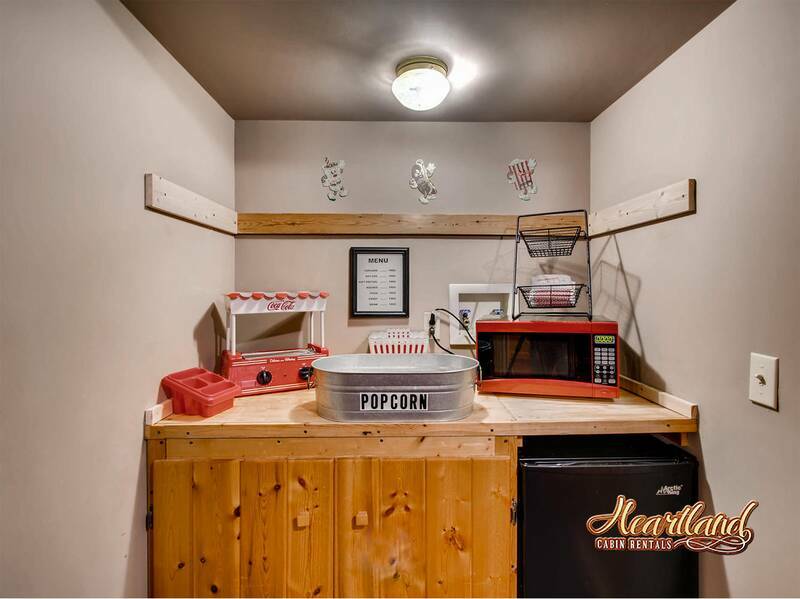 Where the popcorn bar is, used to be a laundry hook-up. It is still there. The drain for the washing machine was open and the smell was coming from the sewer. Imagine the smell. I took several paper towels and made a plug for the drain and problem solved. I would imagine that the cleaning people had taken a plug out previously if there was one there. I left a note for the next people and the cleaners to leave the plug. Didn't have any other problems of any kind while we were there. Would definitely return and rent again. Unique interior and fun place to stay. We absolutely loved it. Everything was in perfect order. Adults and kids had an Amazing time can’t wait to come back. We had a fabulous family time and felt at home in the cabin. The cabin is a little rustic. We paid a premium due to holiday weekend. Heartland was wonderful for late arrival. We ran a little low with some given supplies. Kitchen was well stocked and loved the big tables. I would rent again. Very clean, spacious, and perfect for our family of 9. We loved the screened in porches, and the activities in the basement. The movie room was great. We'd definitely stay at the same place again if we come back to Pigeon Forge. Glad to see the updates on this cabin. Loved the extra shelf put in the kitchen from the year before was easier to have our stuff located. Our youth played games and ate at the big table. The only minus was the rugs was slippery inside the living room. Even though they had things underneath to prevent sliding couple of our adults and children almost fell. Glad it was decorated for Christmas this year also. Hopefully be back next year. Incredibly clean cabin with awesome staff to organize your stay. always ready to serve you. We arrived when the weather was a little unpredictable and they called to make sure we made it safely. They even took the time to remind us to go by the grocery store in case we could not get off the mountain the next day due to snow and ice. Our youth group was very entertained by the pool table, air hockey and movie cinema. I would highly recommend this rental agency to anyone interested in renting clean, well-kept cabins with amazing staff! There were 5 families meeting for a family get-together and it was a great time. The cabin was super and was big enough for all of us. The large table in the enclosed porch was appreciated by all and was the most used so all the families could gather and enjoy each others company. We have dealt with many of the rental companies around Gatlinburg and in my opinion heartland rates 10 out of 10. Super nice and very helpful. I'm relatively new to the cabin rental experience, and I've found it is sooo much better than hotels. This facility is wonderful for a large group, There's so much room for everyone to feel he has enough space without feeling cramped; the strong points of this facility are the grill, dining areas, basement for games, and large parking area. The administrators were helpful to answer questions and took care of a fire alarm with low battery that kept beeping. It was one of the best vacations we've had in years can't wait to do it again. Everything was great loved the cabin. Awesome!!!! this house have everything we need and more. first I love the location of the house. It's in the mountain and surrounded by the trees. House came with nice gas grill and fire pit. That was very nice. In the house it have game room, theater room and hot tub. I wish we had more time to enjoy the house more. Beautiful and clean cabin, perfect for our family gathering. We loved the cabin so very well, everything was more then we expected. We received great service, great communication, great accommodations. The only issue we had was the hockey table. I called Saturday and a hockey puck was brought for the table so that made the kids very happy. Otherwise, we were extremely happy and plan to stay with you again. Have a Blessed Day and thanks again for allowing us to have a wonderful gathering place for our family. We have stayed in this cabin for the last four years, it handles our large group very well, we 16 people per year so having enough parking space as well as enough room in the cabin is really important, The staff at Heartland Rentals is always amazing to work with, Misty and Holly have handled my reservation each year and it goes very smoothly, thanks for allowing us to share in such good memories and this year it snowed on us with was a added bonus. We had a great time with everyone in the same place. The cabin is really spacious, rooms are big and comfortable, the kitchen was capable of cooking a Thanksgiving meal for 16 people. The views and fall colors were perfect. Lots to do in town for the kids and lots of R&R for the adults. We will definitely rent again. The cabin was wonderful. We had several days to enjoy the space. Fantastic. Cabin was very clean, and the staff at heartland rentals was amazing. Spoke to Ashley numerous times and she was most helpful. We plan on returning to these rentals in the future and referring our friends to stay here as well.. Perfect size for our youth group and we found that our group bonded better by staying in a cabin versus a motel. The cabin was everything we needed. everything was in working order and we had plenty of room for our 4 families. The only complaint I had was we were in one of the upstairs bedrooms and the water pressure was low. Although everything else seemed to work properly. Overall experience was great and we will stay with Heartland again. Hopefully next Christmas and in the same cabin. It was nice to hear from the staff prior to our arrival and afterwards to make sure everything was o.k. Had never had that before at other rentals. Thank you for an awesome stay and the wonderful memories that were made. We had a hard time finding the cabin but once we did it was a great experience from there. Great place and friendly office staff. We had an awesome stay ! Plenty of room .... Lots of bathrooms... Loved the screened in patio and hot tub area... Not to far from town but also out to ourselves . This cabin had everything we could have asked for . perfect for our five families and everything we could have asked for.